The latest AP Top 25 Poll of the regular season has the Gonzaga Bulldogs No. 1 yet again. Mark Few's team completed its sweep of the WCC on Saturday, beating Saint Mary's and wrapping a 16-0 conference run. 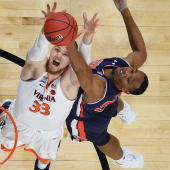 In the latest rankings, Virginia stays firm at No. 2, while North Carolina takes a jump over rival Duke. Tennessee rounds out the top five in light of its home win Saturday against Kentucky. Virginia Tech is the biggest riser in this week's poll: The Hokies snake up six spots to No. 15 after beating Duke last Tuesday. The 22-6 Hokies play at No. 14 Florida State on Tuesday night. Slippage was inevitable for teams with tough losses: Marquette drops six spots, to No. 16, after losing at home to unranked Creighton Sunday. Maryland's 0-2 week (losses at Penn State and at home vs. Michigan) dropped the Terps from 17th to 24th. Houston fell to UCF, dinging the Cougars from No. 8 to No. 12.